VERY FINE. 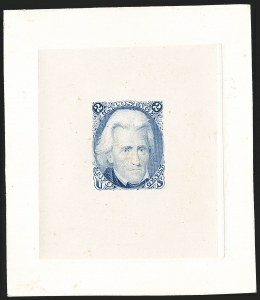 ONE OF ONLY TWO RECORDED EXAMPLES OF THE 2-CENT 1863 JACKSON LARGE DIE TRIAL COLOR PROOF IN ULTRAMARINE, AND THE ONLY ONE FULLY DIE SUNK. There are eight distinct trial colors of 2c 1863 large die proofs (see Faust collection, Siegel Sale 1181, lots 1010-1017). In the 1969 Allen book (page 127), Maryette Lane provides a census of colors known at that time (six in total) and states that no more than two of any one color are known. Our own search of specialized 2c Black Jack sales yielded only two of the Ultramarine. The other example is not die sunk. 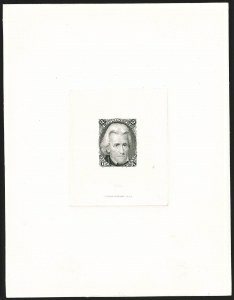 The rarity of 2c 1863 large die trial color proofs is further demonstrated by the fact that none were present in the specialized collections formed by Allen, Brazer, Russo, Rorke or Fosdyke-Ray.